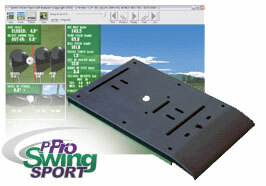 "P3ProSwing SPORT Package P3ProSwing Sensor Unit, Golf Swing Analyzer software, Putting Green, Driving Range, Putting Game, and Accessories to get you started P3ProSwing SPORT Swing Analyzer consists of a 9" x 14", extremely durable, high tech sensing platform and software program that measures and captures the information from 65 optical sensors to create a visual representation of your swing data. You will receive an incredibly accurate, objective, and totally scientific analysis of each swing that you take. The P3ProSwing SPORT is quickly becoming a leading instruction tool, giving highly accurate data of your club before, at and after impact with the ball. Used with any club in your bag, the P3ProSwing SPORT is a complete swing analysis system for golfers of all levels. Best of all, the SPORT evolves into an advanced Golf Simulator with full course play and amazing graphics with a simple upgrade package. Purchase the upgrade within 30 days and SAVE. Dynamic Swing Analysis measures: • Club face angle • Swing path • Angle of attack • Swing tempo • Toe and heel height • Sweet spot deviation • Club head speed P3ProSwing SPORT software also features: • Driving Range • Dynamic Putting Green • Putting Game • Fully Upgradeable Technology Features A Digital Picture of Your Swing Through The Impact Zone Using the P3ProSwing SPORT, you can see the point of impact and gain additional insight into your club swing and how you impact the ball. You will see visually if your swing path was square through impact, if your club face was square as you made contact with the ball, and what angle of attack your club was on at impact. You can also see where on the club face you made contact with the ball to see if you are using the sweet spot of the club and transferring the most energy you have generated with your swing to the ball. Detailed Analysis of Swing And Ball Flight Data In addition to visualization of impact, the P3ProSwing SPORT provides a full range of information that will help you understand the mechanics of your club through your swing and the resulting ball flight calculations. This information includes: Swing Tempo, Club Head Speed, Toe and Heel Heights, Distance, Right and Left of Path. See Your Shot From all the data captured from your swing, the ball flight of your shot is calculated and shown on a driving range or on the putting green. The ability of the P3ProSwing SPORT to predict the shape of the shot is unparalleled. The nuances of fade and draw, push and pull are all generated in a method that delivers a high degree of confidence in the display of the ball flight dynamics. Putting Game Are you serious about wanting to lower your handicap? The P3ProSwing swing analyzer and 9 hole putting game can help you take strokes off of your score. Whatâ€™s Included: P3ProSwing SPORT Golf Swing Analyzer Unit P3ProSwing SPORT Software: - Swing analysis - Putting Green - Putting Game - Driving Range Sensor Pad Lubricant Lint Free Wipes Two Step Tape Sample Pack: - 5 Driver tapes - 5 Hybrid tapes - 10 Iron tapes - High intensity reflective tape strips - Reflective Strip Applicator guide Hosel Numbers Compressed Air (Per FAA regulations, compressed air is not included if unit is shipped via air.) Indoor-Safe Foam Ball Splinter Free Plastic Tees Rubber Friction Tee Power Supply USB Cable Fully Upgradeable Technology If you have any questions about this product or would like to order by phone, please call us Toll Free at 888-733-8383. We look forward to hearing from you!"